I gather from the info I provided, no one can figure out what I'm asking. The car, a 5-speed-manual 1.8L wagon, (on a cold damp morning) won't start, initially. The starter doesn't turn-over. Then, after about 3 or 4 tries, the car starts. On the instrument panel, the EPC light comes on. It seems to be a second "check-engine" light. The owner's manual says that stands for "Electronic Power Control". When I scan with my AutoXray scanner, it picks up a pending code, P0688 "ECM/PCM Power Relay Sense Circuit". I believe now it has something to do with the starter. Anyone have an idea? If not, I guess I'm headed to the dealer. There could be more going on here. I don't think your generic OBD2 scanner is going to pick up Volkswagen-specific DTCs. If you intend to do any amount of work on this car, a VAG-COM diagnostic cable and software package from Ross Tech is a wise investment. I'll be sending you a PM in a few minutes. It'll have a link a picture showing where you can find the ECM power relay under your hood. You could check to see if the relay contacts are dirty or if it's not fully seated, but the relay could also be bad or sticky inside. The EPC light means something is wrong in the drive-by-wire path, the "gas pedal" potentiometers or the electric motor-controlled throttle body, etc. I do not know if that relay qualifies, and I'm not even 100% sure what it does without research, but I assume it powers the ECM up when the ignition is on. Certainly the ECM is part of the electronic power control system, but I don't know if faults with the ECM are going to light the EPC light rather than the check-engine light. When the car is having this problem, does the check-engine light come on with the rest of the lights when you just turn on the ignition without starting the car? It should, if it doesn't, the ECM may not be alive. I did not have the time to pursue it further, so I took it to the dealer. He said a relay and engine RPM sensor needed to be replaced ($472). According to the dealer the oil must be drained to get at the sensor. To answer your last question about about the "check engine light", the answer is yes, it does come on before turning on the ignition. At least it did when I tried it. Its my wife's car. Do you have a homelink visor? It shorts out sometimes (mine did) and can make all kinds of goofy electrical things happen. My EPC light came on, and my car kept running even when the ignition was turned off and the key removed. When I finally figured out that it was the HomeLink and replaced it, all was fine. I do have the Homelink Visor. I never would have thought of that! I'll consider that, next time the EPC light comes on. Well, the car is back from the dealer. They replaced the relay and a sensor located in the block next to the oil filter. It required removing the filter to get at it! over the past few months noticed a slight click inside the car sometimes when accelerating. the car drove fine (except for the EPC light) but it idled at 1500, rather than the usual ~700. I turned the car off and restarted it and it started immediately, like usual, and the light was gone. any idea how to tell if the relay is the culprit? any idea the cost of the relay? having to replace the rpm sender sounds a little unusual..
bump. anyone have experience w EPC light?? EPC refers to the drive by wire system. This system, generally speaking, encompasses the throttle pedal and its position sensors (it needs to know where your gassin' foot is) and the throttle body. Most likely, the EPC light and its associated faults for this scenario are a symptom, not the problem. Meaning the actual root cause is causing the no-start/no crank issue AND fault codes related to the EPC system. And the most likely root cause is an ignition switch, NOT the engine speed sensor. With a bad engine speed sensor, the car will still crank all damn day (or until the battery dies) but the car won't start. For the original poster and the other guy who get a no-crank issue, and then it eventually starts either with or without an EPC light, again, the most likely problem is the ignition switch. Not the starter, not the battery (though the battery proper and the cable connections must be perfection itself to rule them out.) You can get these issues with a visually perfect but still faulty battery connection. Furthermore, the info regarding if the actual Check Engine Light was on or not for the times the engine didn't crank is a very good (and free and easy) way to see what is going on. Pay attention BEFORE you turn the key from "on" to "start"! Meaning, instead of blowing right through "on" on your way to "start" and your attempt at operating the starter motor, turn the key only to "on", look at all the dash lights, and see if the Check Engine Light is coming on or not. If it isn't, your starter isn't going to run, either. And if it is, everything is happy, and you start up and drive away. Old thread, I know, but I just came and picked up the '03 I had lent my brother. He left it in the house's garage for the last two months and the battery was completely dead and won't hold a charge (at least with a jump and running it for 20 min.). Would a dead battery be enough to light off the EPC? I jumped it, ran the car for 20 minutes, turned off the car, and tried to start it without the engine even turning over. The CEL is on before trying the starter. I'm going to try charging it overnight, I just hope it's only the battery. The short answer is, "Yes, a dead battery can also trigger the ECP." The battery which was in question is OEM, so it's about 6 years old and at the end of it's lifespan. The car was still starting weakly, so I drove over to Advance to get the charging system tested. The battery wouldn't even register on the testing rig, so I got a new battery. The jerks wouldn't change it because our model is "labor intensive" and they can't do it if they have to remove any part from the car (cowl). So I went home, took out the weatherstrip and cowl in five seconds, and replaced the battery in a total of abour 6 minutes. Turned the ignition to "on", proper warning lights came on and shut off, turned the switch to "start" and the motor turned over and started at once and the EPC light turned off. Could I also get the link to find the ECM power relay? Hi, I have a 2001 v6 passat wagon and this EPC business is killing me. It only comes on when I'm making a right hand turn up a hill. My freezes up for a second and beeps and the EPC light comes on and says "Engine Workshop". After a few seconds of not moving it kicks back to life but with reduced engine power and then the check engine light comes on and displays the "Emissions Workshop" error. This lasts until I turn the car off and then back on. In the last two months I've replaced both catalytic converters, a couple bad O2 sensors, and (as of today) the battery. Anyone know what I should do next? I have the exact same issue going on with my 1998 Passat. Did you find a fix. If so, what was it and how much did it costs. Hey, I actually have a 2000 Passat. I changed the interior lights and courtesy lights to LED's. In the process of changing the lights in the passenger door I shorted the contacts together. The car was started, and shut off after this happened. The EPC light is on but I am not sure if this is the issue. The car has power but will not turn over. My 2002 volkswagon Passatt shut itself off twice while I was driving and was hard to restart both times. Then while sitting at a red light the EPC light came on and a light shaped like a car motor. I got out the owners manual but it doesn't really explain much. I keep my car maintanced on a regular basis. Csomeone tell me a possible problem and how serious this maybe and if there could be a recall on this. My son just looked on the internet and found dozens of people on a blog that are having the same problems but only said of the problem not the cure. If the engine just dies while driving, the engine speed sensor is the likely cause (if you did not short out the electrical system). It's been posted many times here. Additionally pulling up your fault codes with Vag-Com will show various faults but I'm nearly 100% that it's your engine speed sensor, AKA Crankshaft Position Sensor, just below the oil filter. 078 906 433 A is the part number. I hate bumping old threads, but; when you buy your new engine speed sensor, Do Not Go Cheap! I did. I bought the one from GermanyAutoParts.com and it lasted for only 3 months. So, I thought it was the wiring or something else and spun my wheels about it. Bit the bullet and bought from ECS Tuning there mid to top of the line sensor and it is a hugh difference. The sensor is a magnet. The old one barley help on to the hood of the car, but the one from ECS was twice as strong. I am sure I should have an issue for a while now. In reverse, but chained to a tree. ^ they likely sourced the oem part from the manufacturer, without vw badging, if it was not vw badged. they have a LOT of stuff like that. This is the speed sensor? The sensor shown in the bottom pic is the ESS. OK thanks. BTW the top pick is where the bottom pic plugs in which is below/behind the coolant reservoir. is the speed sensor located near the sensor pictured? also what is an ESS? The ESS is the sensor in the second pic. If you don't know what it is, why did you order one ? i purchased it because I was having some of the same symptoms described in this post as well as others in the forum. I just didn't put ESS together as most wer referring to it as the crank position sensor or just speed sensor. Additionally it was the least expensive repair I could make in the effort to remedy my EPC light issue. 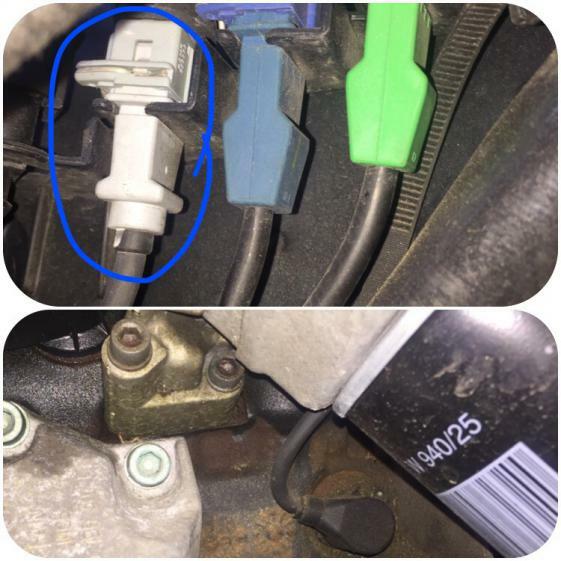 So to assure I'm clear the part pictured is (engine speed sensor or crank position sensor)? Last edited by passatevos; 05-19-2017 at 10:25 AM. According to the dealer the oil must be drained to get at the sensor. The sensor is well above the oil level there is absolutely no reason to drain the oil. If the oil filter needs to be removed it is also well above the oil level. passatevos and axxe like this. I'll post results of the install once ECS sends the part. FYI if you order multiple parts from them at the same time they won't ship [not even the on-hand parts] until all of the parts are in stock. Update: I replaced the ESS and the car started up. I drove it for about 2 days and now the EPC light flashes on every now and they and the car jerks. Is there a fuse/relay somewhere I need to check? Now I'm also getting a P0604 code. Any help anyone?